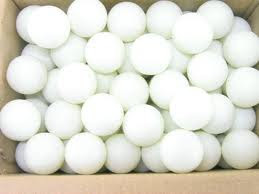 Land the most Ping-Pong balls in a plastic cup with one bounce per ball. Don't miss the variation at the bottom for smaller families and groups. 1. Form teams of 2 players each. 2. One person sits 3 feet away from the cup, while the other person sits on the opposite side of the cup to retrieve the ping pong ball and count points. 3. Everyone has 1 minute to get their ball into their cup as many times as possible. TO DO THIS: the ball has to bounce once on the ground and then land in the cup and stay there. If the ball bounces out of the cup, it does not count as a point. EVERY TIME THE BALL BOUNCES AND STAYS IN THE CUP, THAT TEAMS RECEIVES 1 POINT. 4. Pairs switch who throws and retrieves, and the round is repeated. 5. The points from both partner's turns are added up for a final team score. The team with the most points, WINS! With smaller families and groups, pairing off into teams might not be what you want to do. Instead, set all the cups up in a straight line. Have each person take a turn trying to get a ping pong ball into every cup. You can time them to see how many they can get in a certain amount of time, or you can see how long it takes each person to get a ball in every cup. Have one person bouncing the balls, one person timing, and everyone else retrieving the "missed" ping pong balls. 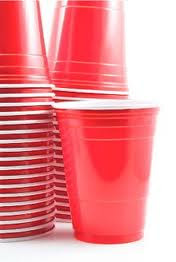 You can also set the cups up at different heights and distances to make the game harder or easier for different ages. What does your family have planned for the weekend? I hope yours is sunny. It's rain and snow for us. What a cute game!! Hey Heather! its diana from Livy Love and we met today at the blog meetup! So good getting to know you, you were so sweet and so much fun talking to! I love this idea. Will definitely try it out with my troop. I am loving this for a date night. OR to figure out who picks the movie! We know how difficult is to make time for writing assignments or completing your reports, especially when you have to meet a particular deadline. That's why we have assignment writing help service with best online assignment help Sydney for students. Enroll now!